MDR Motorsports: Making Dreams Reality through Motorsports. This is Mary's group dedicated to bringing our most-desired racing dreams into reality. As a team, we got involved with a movie that Rookie Garrett Smithley was appearing in . . . ‘A Veteran’s Homecoming’ which is devoted to reducing suicide in veterans. Mary even arranged the opportunity for an interview with Santiago Cirilo, the US Army Infantry Veteran who wrote, and acted in this project. One of my favorite MDR Motorsports missions was Traumatic Brain Injury (TBI) awareness with Jerry Nadeau, a driver who was in a coma for three weeks after a 2003 crash at Richmond. Although he recovered from his head, lung, and rib injuries, he never raced again. 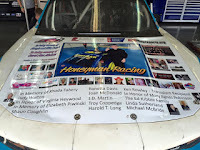 Thanks to Mary Frances – my smiling face was featured on Joey Gase’s Xfinity Camaro. 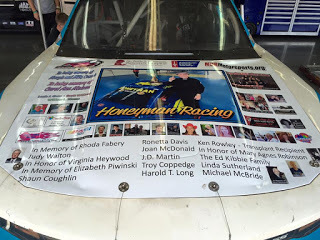 This project was in cooperation with NASCAR OFF TRACK FB Group and "Caring Hands Village LLC" of North Carolina. That is me bottom middle in the red cowboy hat. Our last labor of love was providing regular newsletters for Xfinity Driver, Chad Finchum. So many collaborations and wonderful memories. However, Mary’s greatest skill was her ability to bring people together and create productive friendships. 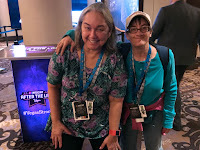 Last year Mary, knowing that I would be attending the year-end Monster Energy Awards ceremonies, asked if I could help her friend, a photographer, get her media credentials for the event. If you knew Mary, you recognized how hard it was to say no to this NASCAR Force of Nature. So that is how I got to meet and work with Shannon Kelly. My NASCAR sidekick, Mary Frances Molzon Dixon reached the checkered flag in her race on this earth much too early. I will always remember her as full of energy, unstoppable, unchallengeable, and unforgettable. May 10 the earthly chapter of life of Mary Frances Molzon Dixon was brought to a close surrounded by her family in her home. Mary was born on May 3, 1952, in Lake County, to Robert and Dorothy (nee Lewis) Molzon. She graduated from Chardon High School and then pursued a B.S. in Business Administration from Morehead State University. For almost 30 years, Mary was a dedicated and trusted Employee Benefits Coordinator at Geauga/University Hospitals. 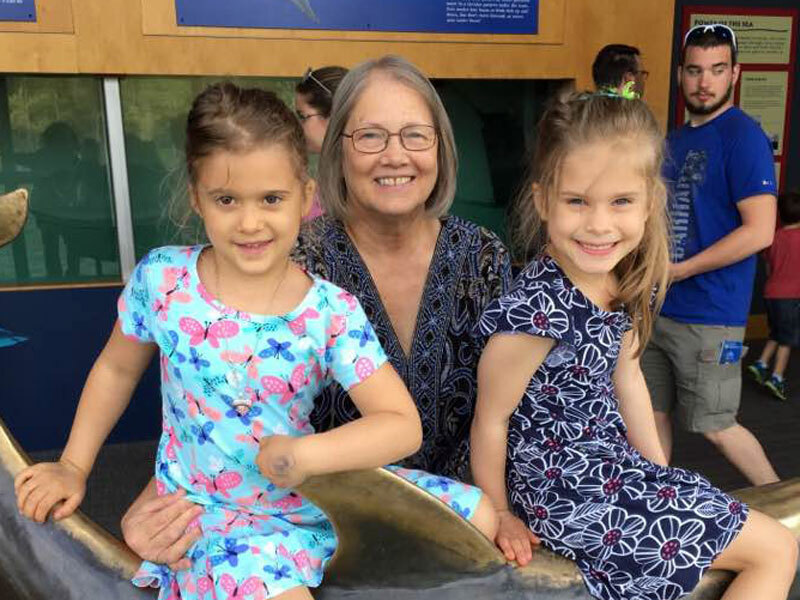 She had always been passionate about helping others feel and become their best, and shared her knowledge of health and clean living through the Shaklee Corporation for the past 30-plus years. 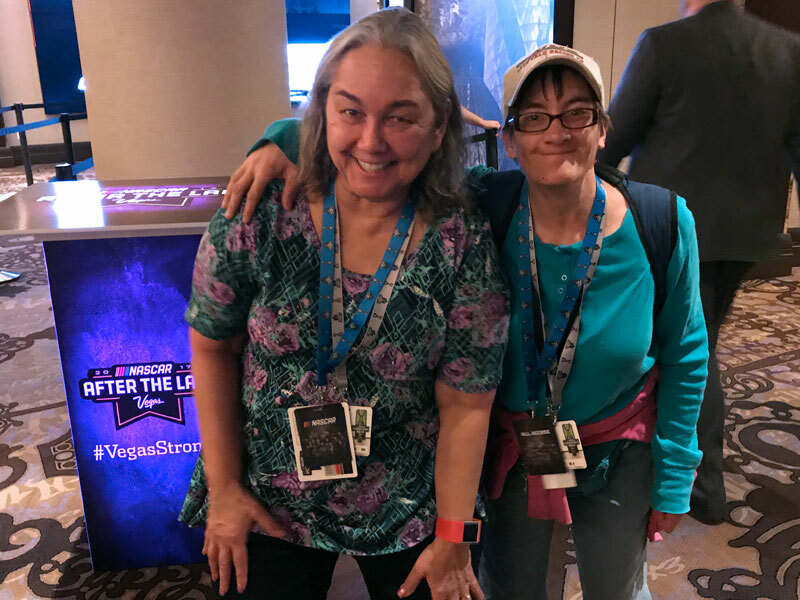 Mary was passionate about fundraising, charity work and affording others an opportunity to see and feel what it was like behind the scenes of NASCAR. Nothing meant more to Mary than spending time with her granddaughters since the moment they entered the world. She nurtured their ability to create, explore and learn. Mary is survived by her husband, James Dixon; son-in-law, Casey Snobl; two cherished granddaughters, Sophia Skyy and Mya James; sisters Janet (Gary) Tipton, Dot (Joe) Maggi, Roberta (Antwon) Prather; brother-in-law, Rick (Marge) Dixon; sister-in-law, Judy Wright; many very special nieces, nephews, cousins; and her devoted daughter, Melody, who never left her side. 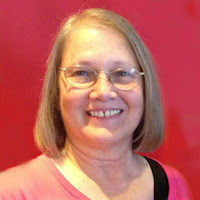 She was preceded in death by her parents Robert and Dorothy; and sister Carol Molzon. A celebration to honor Mary’s life will be held the evening of July 7 at 42nd Street in Virginia Beach. Her smile, her laugh and positive energy will live on through her family, friends and all who were touched by her!